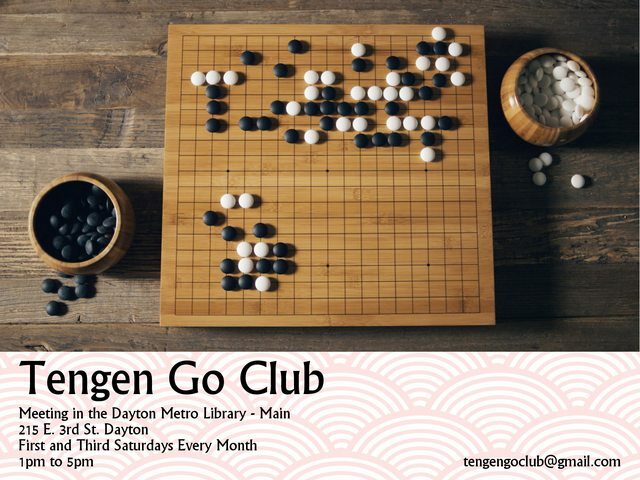 Getting the word out for any Go players in the Dayton, Ohio area. Congrats. Hopefully soon you'll meet every week, from lunch to dinner time. Thanks! Yeah, it will probably turn into an every week thing sooner or later. Just a reminder, to anyone in the area, our second meeting is this Saturday, the 19th! I'm in Oxford, so Dayton's not too far from me...maybe I can make it out there sometime. Have you had much luck getting members? I'm trying to start a club in Oxford and I'm not sure how/where I should be advertising. We are averaging 5 people per club day. Of course, now, this means a few days where there were more people and then there was also that one day where it was just me and one other guy. As far as advertising, I made up a sign with our details and asked to put them up in some friendly businesses around town. Cool coffee shops, cool music shops. I recommend going with a big go board and stones image. This is a magnet for anyone who plays go and will be seen from miles away. And more importantly, i feel, is retaining the people who come. I send out a short reminder email two days before our club day. That has gotten us this far. I have made up a new sign as we have changed hours, now from 1 to 5, and will be going around town to swap out the old signs. I will also get around to getting listed on AGA sooner or later but in no rush at the moment. Thanks for checking in on the thread and please do come visit the club! It is this Saturday! Probably you have advertised in the Miami University campus center? We have expanded our hours. Now meeting from 1pm - 5pm.